Sims Metal Management has added another acquisition to its long list, picking up the assets of Promet Marine Services Corporation Ltd.
Promet is in Providence, Rhode Island. It has a deep sea export facility on the Providence River that comprises over 9 acres of land, a rail serviced 600-foot pier and two deep water berths. The acquisition will serve as the company's main export terminal for the New England region. Infigen Energy said the first public meeting to commence the process for including a community owned wind turbine as part of its proposed Flyers Creek Wind Farm in NSW was constructive and encouraging. The meeting was chaired by Ms Nicky Ison, who has researched more than 30 community renewable energy projects and organizations around the world. A presentation was given by Ms Jenni Mattila, principal of Mattila Lawyers, who is experienced in community owned infrastructure co-operatives, including Australia's first community-owned wind farm. Infigen's development team also presented a proposal for the Flyers Creek Wind Farm Co-operative and answered questions from the audience. "A core group of interested parties have offered to form a committee to facilitate the development of the proposed co-operative. The co-op is looking promising," said David Griffin, Infigen's general manager of Development. Clean TeQ Holdings has won another air purification project for this financial year, which it says underlines a resurgence in this market sector for its business. The $1 million contract is to supply odour control infrastructure to the Coombabah and Stapylton Program Alliance (CASPA) for the upgrade of the Coombabah Wastewater Treatment Plant in south east Queensland. The project will be completed in the second half of the financial year. The contract entails the delivery of covers and ducting for the plant plus biological treatment of the air stream. Clean TeQ said the restructuring and strengthening of its sales capacity it undertook in the last financial year is realizing benefits with the awarding of four projects of $1 million to $2 million each so far this year. The projects are in Queensland, NSW and Victoria. Several smaller contracts have also been won in this period. CO2 Group has welcomed the passing of the Clean Energy Bills through the House of Representatives, and its share price also moved in the right direction. The company said the price on carbon creates three new market opportunities for it: the legislation creates about 500 new potential customers who have a direct liability under the carbon price; international funds can now invest in Australia and repatriate credits created to offshore markets; and big fuel consumers can invest in carbon sinks and opt into the carbon price to avoid an imposed reduction in fuel excise rebates, further increasing the number of potential customers. CO2 said the Clean Energy legislation complements the Carbon Farming Initiative (CFI) which became law last September. The CFI established the legislative and regulatory basis for the creation of carbon credits from Australian projects that reduce emissions or store more carbon in the landscape. The Department of Climate Change and Energy Efficiency expects the CFI to be operational from mid-December 2011. Projects accredited under the CFI will produce carbon credits (Australian Carbon Credit Units, or ACCUs) that are either Kyoto compliant' or non-Kyoto compliant'. Importantly, the Clean Energy legislation allows only Kyoto compliant credits (ACCUs) to be used by companies liable to pay the carbon tax to acquit their liability, said CO2. Project such as those to increase soil carbon are not Kyoto compliant and will generate credits that will only be bought by the Government or sold on the voluntary market. They will not be able to be used to acquit the tax liability. CO2 Group said it has no current involvement in soil carbon projects, and believes that all of its reforestation carbon sink projects will be capable of being registered to produce Kyoto-compliant ACCUs. "It is clear that the process of accreditation is potentially long and it is not likely that start-up or new projects aiming to produce Kyoto-compliant credits will develop a supply pipeline before 2015," it said. The legislation also means that international carbon funds now have a pathway to invest in Australian carbon projects. "Kyoto-compliant ACCUs also have the benefit of being exchangeable with AAUs or RMUs before 2012 and from the Australian Government's perspective they are fully exportable," said CO2. An RMU or removal unit is one metric tonne of carbon dioxide equivalent emissions sequestered from the atmosphere by eligible land use, land-use change and forestry activities. CO2 said the legislation opens up the prospect of joint implementation projects between countries that have an emissions target under the Kyoto Protocol. "Increasingly it will be important for liable companies, or those with large fuel bills, to use a portfolio of options that reduce exposure to carbon price hikes and volatility and currency risks. Importantly the use of international carbon credits is limited to a maximum of 50 per cent of the market from 2015 to 2020." Energy Action listed on the ASX after its IPO was oversubscribed. The $1 shares also listed at a premium of around $1.30 and are currently trading at around $1.23. 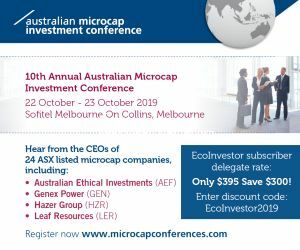 Martin Rushe, the managing director of Moss Capital, which acted as corporate advisor to Energy Action, said the fact that the IPO didn't just get away but was oversubscribed in this market shows that investors see energy prices are rising and that energy efficiency can deliver profits. "The main reason for Energy Action's listing is to fund future expansion plans. We see great opportunities developing in this space," he said. Energy Action's managing director, Valerie Duncan, said "We are very pleased with this result and excited about the company's future in an environment of growing energy costs and future carbon pricing. Energy Action is strategically positioned to help Australian businesses get the best price for energy, minimize energy expenditure and understand carbon pricing and its effects." The company owns and operates the Australian Energy Exchange, an online energy procurement platform where Australian energy retailers bid against one another to supply an organization's energy. The online platform is the only one of its kind in Australia and is said to deliver substantial savings for users. But the company makes most of its money from add on energy efficiency services. Energy Action is an attractive proposition to organizations looking to save money on energy, monitor energy and carbon expenditure or mitigate the impact of carbon pricing, said Ms Duncan. Energy Action has been operating for 11 years and has experienced revenue growth of around 30 per cent year on year for the past five years. The business is profitable and has a track record of paying dividends to shareholders. AnaeCo is in a trading halt pending an announcement that could be made public by 18 October. AnaeCo has welcomed the passage of the carbon tax package by the lower house of federal parliament as paving the way for a new era in environmentally responsible waste management. "The carbon tax will stimulate investment in clean technologies, including advanced resource recovery and recycling systems, as a result of increased costs of disposing unprocessed biodegradable waste to large landfills," it said. The passing of the carbon tax legislation through the lower house saw shares in Carbon Conscious jump from around 30 cents to 42 cents. The company also has the distinction of having maintained the jump in its shares when the carbon tax was announced in July. At that time its shares jumped from 14 cents to 35 cents. Not surprisingly, the company has welcomed the vote, saying it is a major milestone in the birth of Australia's new carbon economy, and that it expects to be a major beneficiary. Executive chairman Steve Lowe said the passage of the Clean Energy Bill 2011 paves the way for substantial expansion of the company's carbon forest sink operations. "The Board is currently examining a proposal to massively increase the size of the 2012 planting season from 2,000 to 10,000 hectares. We have 8,000 hectares of Mallee Eucalypt trees under management and are aiming to more than double this in the next planting season to accommodate the anticipated new demand for carbon abatement. The company quotes a CSIRO estimate that with a $20 per tonne price for carbon, carbon forest bio-sequestration projects have the potential to sequester 350 million tonnes of carbon dioxide equivalent per year by 2050 - an abatement potential of $7 billion per annum. "The Act provides a clear carbon pricing mechanism for Australia's largest carbon emitters to purchase carbon credits on an open and transparent market from accredited suppliers such as Carbon Conscious. Cell Aquaculture says it is making significant progress in Malaysia, with its joint venture project with the Terengganu State Government having been resurrected. The joint venture, TRG Cell Sdn Bhd, established a 100 plus tonne per annum production facility in Terengganu State a number of years ago but the project stalled due to a lack of funding. Following extensive discussions, the Terengganu State Government has now reallocated its shareholding in the TRG Cell venture to Lembaga Tabung Amanah Warisan Negeri Terengganu (LTAWNT), a subsidiary of the Terengganu Government's primary investment arm, Terengganu Inc. Cell Aquaculture said LTAWNT is a substantial and well funded entity, making it an outstanding joint venture partner and the project can now realize its full potential. LTAWNT recently provided TRG Cell with a first stage of funding of RM1.6 million ($520,000) to recommence production from the existing facility and Cell Aquaculture has received an initial payment from TRG Cell of RM500,000 ($165,000) against monies owed as a goodwill payment to progress the project. The TRG Cell project is focused on recommencing full production from the existing facility and developing the project up to its previously agreed production capacity of 500 tonnes per annum and beyond. Cell Aquaculture is negotiating a Buy-Back' agreement for all produce from the joint venture. This would significantly boost its Premium Barramundi inventories and assist in fulfilling a major supply void'. The produce will be marketed through Cell Aquaculture's subsidiary, Cell Aqua Foods. Clean Seas' 2011 batch of tuna fingerlings survived up to 150 days in the cold open sea environment, compared to the 2010 batch that survived up to 38 days and the 20009 batch that survived up to 35 days. With its shares at around 2 cents and only marginally above their all time low, Eco Quest has placed 3,333,333 shares at 3 cents each to sophisticated investors. The placement raised $100,000. European Gas has restarted operations in the Lorraine region of France. The Folschviller-2 well is now under production testing. The company said this is the first coal bed methane horizontal well drilled in France and has two horizontal drains located in two separate thick coal seams. This type of well has been shown to economically produce gas from coal beds in geological conditions similar to the ones existing in company's Lorraine Permits, it said. The drilling is to determine coal bed parameters and define the lateral extent of the coal beds. "The production test will be carried out over the next few weeks. A dewatering period, typical in coal bed methane wells, will be followed by a gas production period where flow rates and gas quality will be evaluated," said the company. Geodynamics said it welcomed the passing of the Government's legislation to establish a carbon pricing scheme and looks forward to its passage in the Senate in November. Managing director Geoff Ward said "The passing of the clean energy future legislation provides vital long term support for the transformation of the Australian energy market. It is a major initiative that clearly addresses energy security and foreshadows a necessary transition, likely to take place over several decades. The legislation gives Australia the policy backbone it needs to build renewable energy alternatives while continuing to provide affordable electricity on reliable, high quality networks." Greenearth Energy has extended its non-renounceable rights issue to 4 November, No reason was given but Greenearth's shares are currently around 7 cents. Hot Rock has received firm commitments for a $785,000 capital raising by way of placement of 31.5 million shares at 2.5 cents each. The funding is for ongoing exploration and evaluation of the company's geothermal projects. Managing director Mark Elliott said the level of support received had been pleasing given the current challenging market environment. "The outlook for geothermal energy is strong and the funds raised will enable the company to continue to progress its portfolio of projects towards development. HRL is the largest holder of granted volcanic geothermal projects in Chile and Peru. All tenements are 100 per cent owned, providing the opportunity for favourable farm-out terms to fund future exploration and development costs to fast track projects," he said. A total of $500,000 worth of shares will be placed and issued without shareholder approval with the balance of $30,000 worth subject to shareholder approval. It is proposed to offer $255,000 worth of shares to directors or entities related to directors of Hot Rock, subject to shareholder approval. Shares in MediVac have hit an all time low of 0.1 cent, the lowest allowed by the ASX. At the same time La Jolla Cove Investors has converted 44,117,647 shares for $75,000, an average price of 1.7 cents each. La Jolla is known for converting its convertible notes to shares at a discount and dumping them on market. Shares in Metgasco have hit a 10 month high of 44 cents, probably fueled by the possibility of a takeover offer. Nanosonics is to increase its production capacity of its Trophon EPR disinfection unit by 50 per cent with the lease of premises adjacent to its existing manufacturing facility. The fit out will be completed in November. Meanwhile, the manufacturing team has doubled production output since July, and improved process stability and the scalability of the manufacturing process. Nanosonics is evaluating options for a new headquarters and manufacturing facility in Sydney. The focus is on maintaining its strong manufacturing capability in its existing facilities while implementing a step change in capacity with its planned new global headquarters, it said. The upgraded International 220V version of the Trophon EPR has been achieved ahead of schedule and full commercial release is underway to the European and Asia/Pacific markets. Nanosonics is now targeting the N20 Trophon EPR for release into other key international markets which support the 220/240V standard. Petratherm said the flow test operation for its Paralana 2 Deep Geothermal Well was successfully completed on 10 October. The Paralana 2 well flowed continuously over seven days and a total of 1.28 million litres of fluid was produced, with flow rates ranging between 1 and 6 litres per second. After flowing for six days, the bottom hole flowing fluid temperature at the perforated interval 3679-85 metres was recorded as 171 degrees Celsius, in line with expectations. The test was to assess the extent of the naturally over-pressured zone and to collect brine samples for geochemical analysis. An understanding of the brine chemistry is critical to managing future production flows and plant design as it can help minimize and manage any scale build up or corrosion over time. If extensive, the naturally over-pressured system will assist later circulation of fluids between wells, reducing the amount of pumping needed, and may influence the configuration of injector and producer wells during later expansion of the field. Final conclusions from the test will be known in several weeks when sufficient pressure build up data is available to assess the degree of aquifer recharge in the vicinity of the well. Geochemical fluid analysis performed by geothermal brine specialists GNS Science (New Zealand) will take several weeks to complete. The joint venture partners say they have identified a natural geothermal system at Paralana. Meanwhile, Petratherm has welcomed the carbon pricing legislation through the lower house of Federal Parliament. The introduction of a price on carbon creates the investment framework and certainty needed to enable significant renewable energy development; the $13 billion investment through the new Clean Energy Finance Corporation and the Australian Renewable Energy Agency will provide funding to the development of renewable energy projects, it said. Shares in Southern Crown Resources have hit a all time low of 12 cents since they listed in December last year. Chairman Bruce Fulton has decided not to stand for re-election as a director at the October annual general meeting as he said he wishes to focus on other commitments. After almost a year since its launch, the Climate Advocacy Fund now has $6,431,573 net under management. In terms of performance, the Fund achieved a total return of 6.8 per cent for 2010-11. This included distributions of 5.06 cents per unit. However, with the recent market downturn, the total return since inception has been -0.2 per cent. The current buy price is $0.9337 and the sell price $0.93. The Fund provides a return similar to the broad share market as it uses an index or passive management approach based on the S&P/ASX 200 Index. A portfolio is constructed using an economic footprint' weighting, and funds are invested with Realindex Investments, a subsidiary of Colonial First State. As a shareholder, the Fund then advocates for these top 200 companies to improve their climate performance. Ocean Power Technologies, Inc has appointed two new directors, David L. Davis and Bruce A. Peacock. David Davis is the Vice President, PJM Development for NRG Energy, Inc. (NYSE: NRG), where he leads project development activities within the PJM Interconnection - the largest Independent System Operator (ISO) in North America. His responsibilities at NRG Energy have included both traditional fossil fuel projects and projects in the renewable energy sector such as solar, biomass, terrestrial wind and offshore wind projects. Prior to joining NRG Energy, Mr. Davis served as a consultant to the energy industry, focusing on energy project acquisitions and development. Bruce Peacock is the chief business officer of Ophthotech, a biopharmaceutical company, where he is responsible for strategic planning, finance, manufacturing, intellectual property and business development. Mr Peacock is also co-chairman of ALBA Therapeutics. He previously served as president and chief executive officer of Adolor Corporation and Orthovita Inc. and held senior positions at Cephalon, Inc. and Centocor, Inc. Nominations for the corporate awards category of the Australian Sustainability Awards are invited from anyone impressed by a company's sustainability performance over the last 12-18 months. Any company can be nominated provided it is either ASX-listed or provides a public report on its sustainability performance in Australia. This is the second year that companies that are not publicly listed are eligible. Companies cannot self-nominate but they will be invited to make a submission if they have been successfully nominated. Nominations must fall into one of four categories: environment, social/community, sustainable infrastructure or sustainable new enterprise. A company can be nominated in more than one category. Awards are determined for a company's achievements in the area nominated. The awards encourage companies with great projects or are making fundamental improvements. The 11th annual Awards will held on 6 December in Melbourne.